Dario and Sabine Schwoerer may have chosen the wrong goal 16 years ago when they set out to reach the highest points in the world. But they gained a family, a world of friends, and experiences that no one else has had. Literally no one else. For example, in August they sailed a sloop through the Northwest Passage from Nome to Nova Scotia with a 7-month-old baby and four other children on board, becoming the first to complete the passage by way of the newly ice-free Fury and Hecla Straits near Hudson Bay. And they did it in an unheated boat. Which was also how they spent a winter in Cordova. These are tough people. But after getting to know Dario a bit, I realized toughness wasn't his most important quality, just as his goal of reaching the top of the seven continents is no longer the essence of his family's story. It was his sweetness that impressed me. 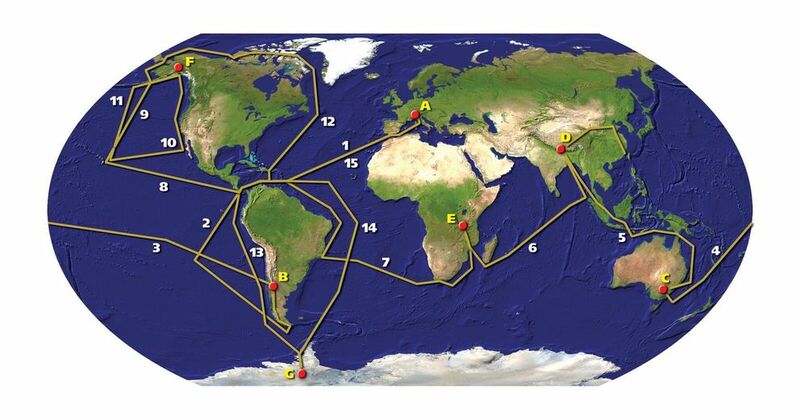 Schwoerer, a climatologist, visited schools in more than 100 countries to talk about climate change during his voyage. "I believe climate change has also a good part," he said, in his mild German accent. "It brings really people together as problem solvers, working together, and helps also to build bridges and finally brings about peace on Earth. So I don't like to see this divide of deniers and people who are pro-climate change. I really like to see more relationship between these two extremes." The TopToTop Global Climate Expedition began in the melting Alps of Switzerland, where Schwoerer was a mountain guide and saw the icy peaks he loved disintegrating. The couple set out to bring attention to the problem by climbing the highest peaks of the seven continents without the use of motors. That required a sailboat to get to the continents. They borrowed from a guiding client to get the Pachamama, just an aluminum shell with a mast and a few sails, promising to finish building it while afloat. Along the way they worked and accepted gifts from local people who believed in their mission. Cleaning up the world became part of the voyage. The Schwoerers landed in Kolkata to climb Mount Everest, biking and walking to get to the mountain, then spending four months removing the disheartening mess of tents and other gear left behind by other expeditions. The family had started to grow by then. Sabine carried 5-month-old Noe from the boat to Everest base camp. Climbing on Aconcagua, at 22,800 feet the tallest mount in South America, she was six months pregnant (although she didn't go to the top for the baby's safety). That trip also included a bike ride of more than 500 miles. Victorinox, the company that makes the Swiss Army knife, began sponsoring the expedition in 2005. The Schwoerers found many ways to use its products. For example, Swiss Army knives cut the umbilical cords for each of the five children. By the time they spent the winter in Cordova, 2013-14, the family had grown large enough to form a band. The children also learned to work with the public and other students at the many stops when they presented to schools and community groups — the adventures get them invited and they leave behind a message supporting the environment and human unity. In the spring of 2014, the Schwoerers sailed to Whittier, climbed over Portage Pass (they couldn't go through the tunnel without motors) and biked to Anchorage and Talkeetna, presenting to more than 3,000 students on the way. Dario and some friends biked to the end of Petersville Road, worked their way to the Kahiltna Glacier and climbed to the top of Denali, summiting 17 days after leaving the bikes. They returned on skis, foot and packrafts. Schwoerer was impressed by how clean Denali was compared to other famous peaks. He loves Alaska. Cordova has been the family's happiest stop, where the kids attended school and made friends. Wild nature was close at hand, and food came from salmon, berries and moose they could harvest themselves. They tried heating the boat that winter in Cordova but the aluminum hull gathered too much condensation. The family added insulation but stayed warm mostly by bundling up. After 16 years outdoors, you get used to it, Schwoerer said. 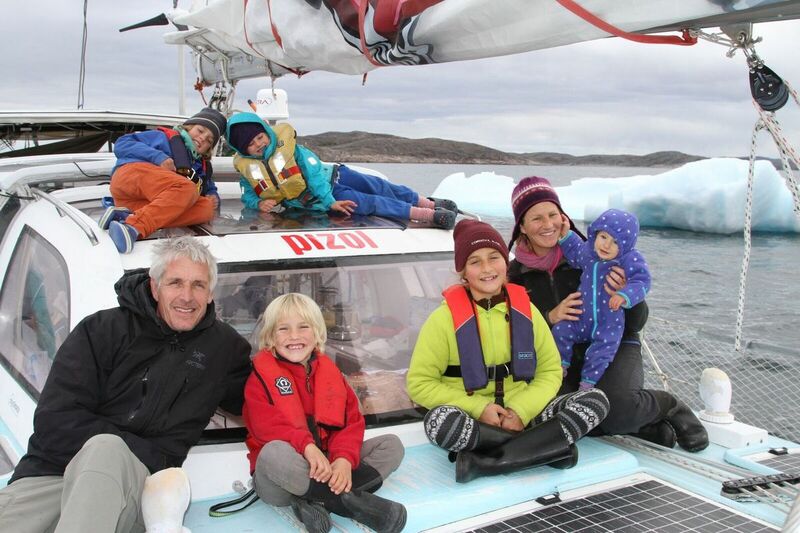 The family left Nome headed east in early August after a visit to the town dump to get boards and tires for a bumper to protect the boat's bow from ice. Along the way, the family played their music and spoke to classes in the Native villages of the Arctic. Baby Mia took her first steps. In the fall, they sailed along the U.S. East Coast visiting schools. A visit to New York City comes next, to be followed by a voyage to bring school supplies to children in Haiti. Schwoerer has only one peak left. In 2004, the expedition was turned back from 16,067-foot Mount Vinson, the highest mountain in Antarctica. Afterward, the boat was nearly torn apart in storms in the Southern Ocean. Assuming Schwoerer can find sponsors and raise more money, he plans to return. But he wants to live in Alaska because of the people here. The great discovery of the 100,000-mile journey, it turned out, was not found at the highest peaks but in the wonderful diversity, warmth and genius of the world's people. The family loved Cordova best because they found all those qualities in one place. Schwoerer said climbers bent on conquering the highest mountains don't seem to care about the environment or the culture around them. If he were to do it again, he would climb the world's most beautiful peaks instead of the tallest. And he would continue to clean up beaches and mountains with local people at his side. "I really like to stress that what you see on TV and the news, that is not the world," he said. "You have to go out and explore. You will find out there are so many good people out there."